Spend an unforgettable day in contact with the local flora and fauna in a specialised centre where we can observe various animal species up close but, most of all, where we can make friends with sea turtles: we can pet and swim alongside them! 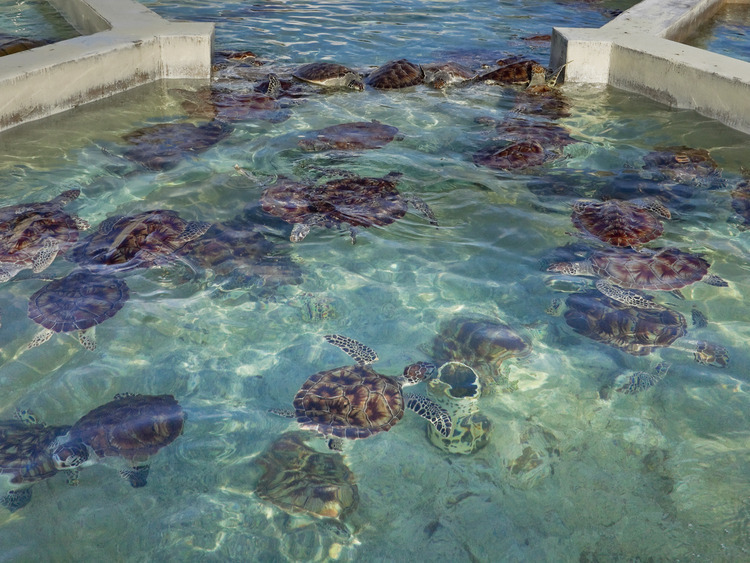 We spend a day in contact with nature at the Cayman Turtle Centre, a sea turtle farm home to 8,000 green turtles from newborns to adults of all ages. We visit the large farming tank and enjoy a close encounter with the younger turtles in a dedicated area where we can pet them. We follow a nature trail surrounded by local vegetation and, with a bit of luck, we might spot a few rare animals such as white-crowned pigeons and agouti, rodents similar in size to hares. We wander around the open-air aviaries where we can see parrots, ibis and peacocks making a nest or looking for food as they show off their fantastic colourful feathers. We dive into a large saltwater lagoon where we experience the incredible thrill of swimming alongside the turtles and observe sharks and other abyss creatures up close by peaking at the fascinating predator tank, separated from us by a clear panel. At the end of the visit, we enjoy lunch at the Schooners Bar and Grill before returning to the ship.